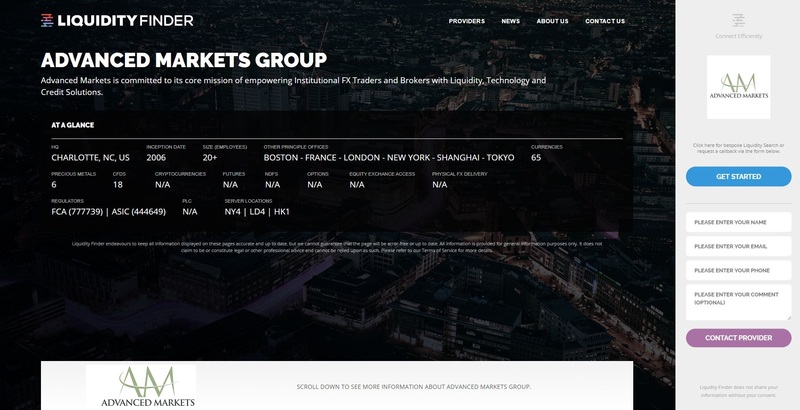 London, UK – April 8, 2019 – Liquidity Finder Ltd, (LiquidityFinder) is pleased to announce that Advanced Markets Group, a leading Prime of Prime Liquidity Provider, which is authorized and regulated by the Australian Securities and Investments Commission (ASIC) and the Financial Conduct Authority (FCA) has joined its interactive website. LiquidityFinder is a liquidity solutions search tool that provides a consolidated view of liquidity providers for institutional and professional market participants looking for eFX, CFD, Crypto liquidity and other OTC electronic markets. 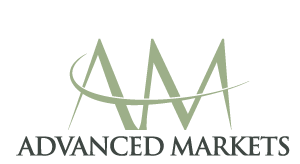 Advanced Markets Group consists of Advanced Markets LLC, Advanced Markets Ltd and Advanced Markets (UK) Ltd, and provides trade execution and superior solutions to banks, hedge funds, commodity trading advisors, corporations and other institutional market participants. “We are pleased to be joining the LiquidityFinder portal, as this is the first directory of its kind that features players from B2B space. The FX Market is dynamic and complex, with a significant gap between the institutional and retail spaces that is not bridged. This gap has widened even further post credit-tightening. There is a lot of liquidity recycling going on, which doesn’t add value and introduces inefficiencies into the marketplace. Using LiquidityFinder, new entrants and existing players looking for genuine institutional liquidity will be aided with detailed, vetted information that will help them to make the right decision about their liquidity sourcing.”, said Natallia Hunik, Global Head of Sales at Advanced Markets Group. LiquidityFinder is an FCA regulated liquidity solutions search tool that provides a consolidated view of liquidity providers offering eFX, CFD, Crypto and other OTC liquidity. LiquidityFinder makes the comparison of (and contact with) liquidity services easy, straight forward and transparent. LiquidityFinder takes the guesswork out of finding the right liquidity partners so that banks, brokers and asset managers can make well-informed choices to maintain a competitive edge and build long term successful partnerships. Advanced Markets is a wholesale provider of liquidity, technology as well as credit solutions to institutional clients globally. This includes clients such as brokers, fund managers, hedge funds and CTAs (commodity trading advisors). The firm’s products support direct market access (DMA) trading in spot FX, energies, precious metals as well as CFDs (contracts for difference). All in global indices and also in commodities. Through our extensive client base, we estimate that Advanced Markets liquidity ultimately serves more than 40,000 institutional and individual clients in more than 30 countries globally. Very Noteworthy: The company is privately held. Outside investors include Macquarie Americas Corp Inc., a wholly owned subsidiary of Macquarie Bank and BGC Partners.